This morning, although blustery, I headed out to pick up a few things. My main objective was to find nice boxes that I could put smaller amounts of cookies in to give as gifts. Exiting my car and hitting the door lock button, a woman who was parked nearby said, "If you'd like a carriage, I have one here that I'm done with." Smiling and thanking her as I took the carriage from her, she replied, "A woman gave it to me earlier and I thought I'd pay it forward." "We do need to do more of that," I said, thanking her and wishing her a Merry, Merry Christmas! Her small gesture had put a smile on my face before I went into the store, making my shopping a little more pleasant. When placing the bags in my trunk, a woman pulled in and while locking her car I said, "Here's a carriage if you need one. Someone gave it to me earlier and I thought I'd pay it forward." Exchanging small talk about Christmas cards at first and Christmas wishes later, I knew the gesture had put a smile on her face as well. Great boxes and at a great price...only $2.00 each!! Please do something nice for someone today. It will make them feel good. i loved the movie pay it forward and thanks for the reminder to do just that. i have never heard a shopping basket called a carriage... i assume it was a shopping basket or shopping cart... so whatever we call it, carriage, cart or basket.. pay it forward is a good thing.... i am on a roll today learning new things on blogs. We call the shopping carts here. Yes, those very small nice gestures are wonderful. I donate to the food bank too; a very good cause and it takes so little effort to help. We should all give what we can. Time are hard and our local food banks are being stripped bare almost daily. I like giving cookies as gifts. They are a low cost, fun festive holiday option. it's amazing how something so small can make such a difference in someones' day. Love those boxes. 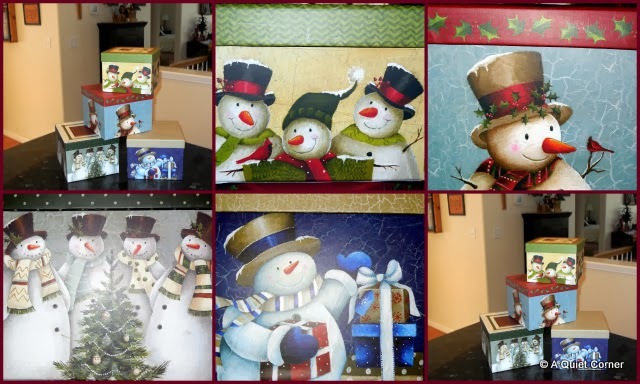 Love the cute snowmen boxes! Paying forward is a nice thing to do, I wish more people would be like you. Sounds like a great day. Enjoy your new week ahead! Agreed - pay it forward every chance you get! Bless your heart and love your mosaic! Very Good advice, JP, and only wish that some of the motorists we encountered while heading to NJ yesterday were in the same frame of mind.